Russell Fair is looking forward to celebrating its second annual Special Needs Day at their fair this year. Reeann Slater, a new director at the start of this initiative, who was looking for a way to contribute to her local fair, brought the idea forth. “My Special Needs Day at the fair all started 3 years ago when I visited South Mountain Fair on their opening night,” says Reeann. She says she was excited to find out about the program as her son’s godmother is in a wheelchair and she has a few close friends who have children with special needs. “I just needed to find out more information on how I could bring this to our fair. I now knew what my first calling was for the fair,” says Reeann. She left that evening feeling excited and started to make a plan to bring to the next board meeting. She had always loved going to fairs, sometimes while at fairs, she would wonder how special needs kids and adults get to enjoy this? Many people with special needs have difficulty handle the lineups, noise, and crowds. “I was given the go ahead from the board to start this up and run with it and that is what I did,” says Reeann. The first step was to raise money to hire the additional attractions which included a petting zoo, tractors, a Mad Science show, face painting, a musical act, balloon artists, a craft station and a free ice cream cone. Reeann hosted a paint night fundraiser, which sold out in a matter of five days. “The community was behind this event and with help from some other directors we had a hugely success event and we raised $1,700.” Reeann was also able to collect sponsorship from a local community organization. Next, Reeann made an event poster and shared it within the community. Within a month, 72 people had signed up. “The parents were so excited and thankful when they called to sign their child up. I loved every moment of this,” Reeann said. There was support all around. Reeann recruited another director, Abbey McFaul, to help out and Robertson Amusements were so excited they offered free rides for select rides as well as a free game and complimentary cotton candy. The board also wanted to give guests something to take home, so Reeann ordered backpacks and filled 100 of them with products that had been donated. Items included a squeeze cow from the local township, pencils, erasers, snacks, water, tattoos and stickers. “I was so excited to know we were giving them a keepsake from there day at the fair with the great memories of their day at the fair,” says Reeann. 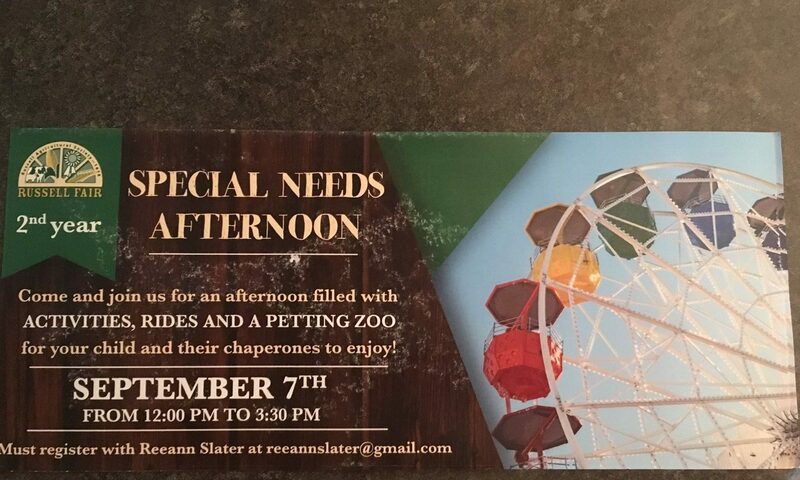 But as much as you can plan for an event at your fair, that even included greetings from one of Reeann’s friend who was in a wheelchair, sometimes you get rained out. “Unfortunately Mother Nature took a turn for the worse and there was a rainstorm the previous day as well as the day of the event, which meant there was mud everywhere. Luckily we were able to move the attractions into the arena,” says Reeann. Guests arrived with huge smiles; they couldn’t wait to have their turn at the fair! So off they all went to start their afternoon at the fair. Reeann had planned for two hours of planned activities followed by an hour on the rides. Reeann says she will never forget the joy this brought to the kids and the tears in some of the parents eyes. Many parents thanked her for organizing this event. She is currently in the midst of preparing for their second annual Special needs Event this September, which will include a magician this year.